Preview Day Two: Play resumes in De Haan, further upsets on the horizon? The 2017 ITTF Challenge Belgium Open produced plenty of talking points on the opening day of the event and there’s another exciting fixture line-up planned for Friday 3rd November as competitors return to the tables for the penultimate day of play in De Haan. Jennifer Jonsson is one of six European players left standing in the Women’s Singles event, but a difficult task awaits the Swede in the Round of 16. Twice the Swedish contestant accounted for seeded opposition on Day One, claiming impressive victories over the 11th and 26th seeds Song Maeum and Bruna Takahashi. However, Jennifer Jonsson will require her strongest performance yet if she is to upset last year’s runner up Yui Hamamoto. One fixture which could very well be worth following closely sees Adina Diaconu take on Saki Shibata. With just six positions separating the two players on the seeding list we could be in store for a close contest from the teenage stars but who will hold the edge when the Romanian and Japanese contestants meet? Germany has three representatives competing in the last 16 of the Men’s Singles draw including fifth seed Patrick Franziska. While Patrick Franziska is yet to be really tested so far in the competition the 25-year-old has been handed a tough encounter with Hong Kong’s Ng Pak Nam, who heads into the tie off the back of a terrific result against 10th seed Grigory Vlasov and most certainly holds the potential to cause an upset. Sanil Shetty is the sole Indian player remaining in the Men’s Singles tournament and will aim to fly the flag in the quarter-finals but he must first negotiate a tie against the player seeded 14 position higher than him, Chinese Taipei’s Liao Cheng-Ting. The 14th and eighth seeds meet in the Round of 16 as England’s Samuel Walker goes head-to-head with Korea Republic’s Kim Donghyun in the lower half of the draw, while Marcelo Aguirre will attempt to topple another seeded opponent when he takes to the stage to face Darko Jorgic. 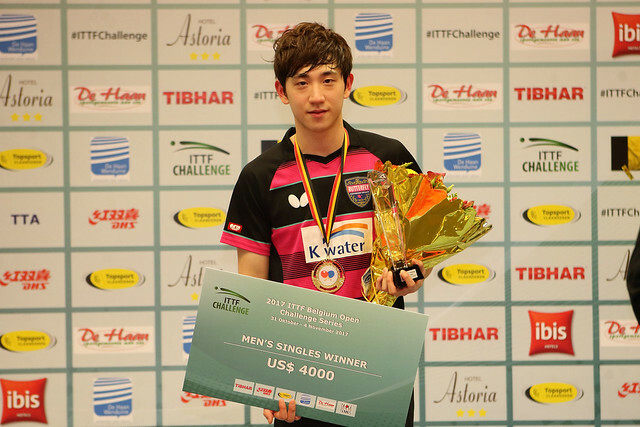 Day Two also sees quarter-finals action played out across both of the doubles competitions and the first gold medals of the 2017 ITTF Challenge Belgium Open will be handed out as the Under 21 Men’s Singles and Under 21 Women’s Singles categories draw to a close.